was just wondering how everyones projects are coming along, how you going Cec with your contraption? This weekend my bike is off at the mechanic removing un-needed wires, and getting new tyres. Its not long now to we all twist the throttle, im really looking forward to it, hope you all are to. I will post a pic of my bike before the event to finish off the build. Very nice bike you have there mate. They still look classy. The bench it state of the art to, ive got an old wooden bench with the legs cut down LOL. Are you taking the barrels off and giving the ports a tickle? Just started to put my RGV 250 back together, what a job. Anyway back to the shed for a while for me. the RG is on its way. The bike is almost finished just a couple little details and we will be up at the salt. Just thought i would post a pic to see what everyone thinks. Just need to tighten up a couple bolts here and there, mud guard on the rear and chain guard and i will be ready for the big white dyno. that's a great little bike with lots of scope for future mods at not too much expense. i remember those bikes when they were new. love that 2 stroke sound. Nice bike Stecky jnr! Love the two pokes! Look forward to hear it scream down the salt! 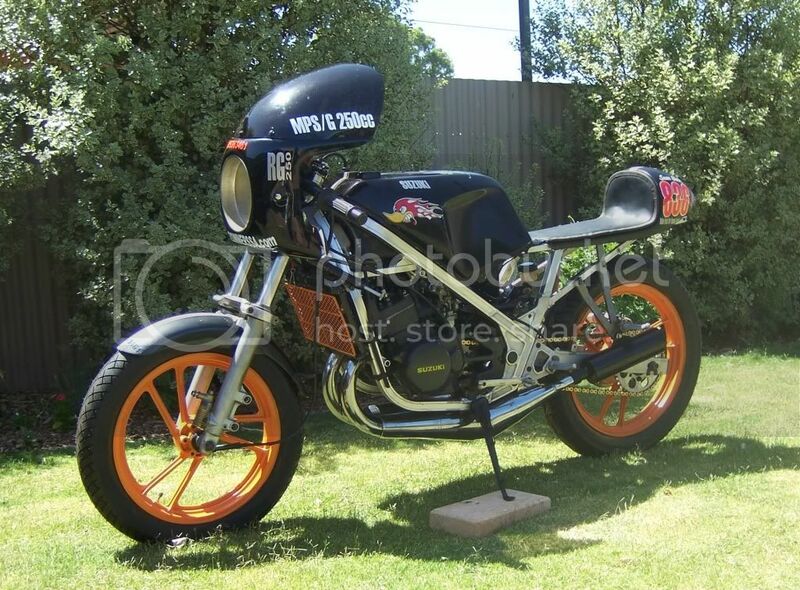 Sweet looking ride jnr, love the cafe style tail on it. All the best for the big white dyno. Very nice. You should be proud of yourself. Love the sticker on the tank. Better get back to the shed or i wont get mine finished. mmmmmmmmmmmm now that will sound GREAT. I havnt heard a H1 at full song for quite a while. Lush Racing has made some nice Kwaka triples. Now that should be something to hear, see and smell. I had one a few life times ago, wheelstands and a frame that was hinged in the middle. It had no airbox and the induction roar was louder than the standard pipes. I now know what devastation looks like ! Poor bugga his RD 350 is loaded and we can't be stuffed unloading and re-arranging the megga load, so its still going. I think the worst part for Cec is that Dad was letting him get his A license in his '39 Chev this year . ...some of us know the feeling ...well theres always next year maybe sorry to hear cec that makes at least 2 of us working through the meet. Unfortunately,,Team Silverton broke LOTS,,but no records,not even beams,, apparently there was a sign just before the 2 mile that said "Silverton vehicles turn off here"